Why did the talking pinata cross the road with a boy carrying a baseball bat? 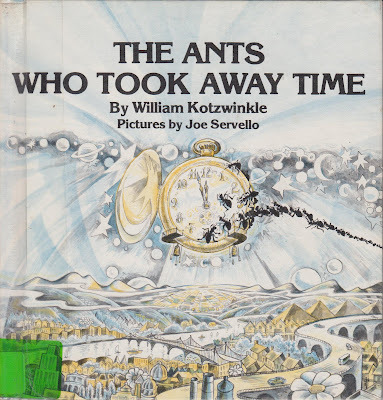 I have been collecting funny, vintage children's books for many years. And by funny, I don't mean ha-ha funny. I mean - Oh, my god, what were they thinking?! funny. Today I picked up these gems at a used book sale. 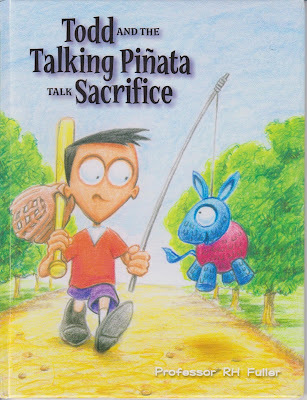 Do you think that talking pinata should be a little bit worried that Todd is carrying a baseball bat while he thoughtfully explains the true meaning of sacrifice? What are the chances that road leads to a birthday party? There is no way this picture book was not written with the help of hallucinogens. On page 2 it says..."The Creator of the World stopped by to see how things were going. She liked to wear disguises and had come as a porcupine, which caused a lot of trouble." But perhaps more troubling is the fact that the ants in the story speak in numbers and symbols. I'm not sure if they're swearing or if they're just from the colony of ants formally known as Prince. The next little nugget I unearthed from the children's table at the book sale was a cute book called MISERY. Shall we play a game? It's called, WHICH ONE OF THESE PAGES DOESN'T BELONG? Misery is when you find out there's no such thing as Santa Claus BECAUSE YOU'RE READING THIS BOOK! WHICH ONE OF THESE PAGES DOESN'T BELONG? What the heck..? Is this some kind of sneaky anti-smoking campaign slipped into the pages of a kid's book!? Just how many young children were smoking cigarettes in the 1960's?